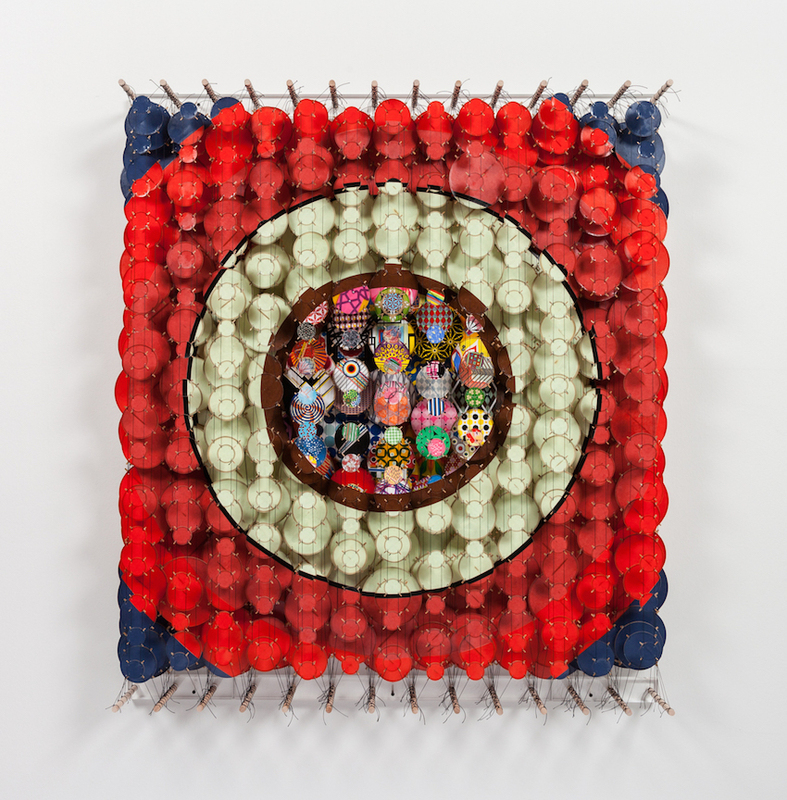 “The Scale of Worlds” typifies Jacob Hashimoto’s “kite” works. Vertical layers of “kites”—multi-sized, circular-shaped pieces made of paper and bamboo—are threaded together and suspended between two rows of pegs, filling a square space on the wall. From afar, the “kites” resemble a patriotic-colored target. Nearing the piece reveals a contained, visual dance of individually painted and decorated circles. This piece is at the essence of “In the Cosmic Fugue,” a solo exhibition at Rhona Hoffman Gallery that demonstrates the artist’s interest in space. His “kite” pieces hover between painting and sculpture: in this exhibition they are displayed on a wall much like a painting, but their three-dimensional quality inhabits the visitor’s space like a sculpture. These, along with the artist’s oil paintings also on show, challenge how visitors perceive and engage with dimensionality and its representation. Hashimoto, an American artist influenced by his Japanese heritage, has long used “kites” in his practice, from sweeping site-specific works to smaller, contained pieces like these. Although each “kite” work varies in size and color, they are united in the visual experience evoked. When standing at a distance, seemingly pulsating circles generate an illusionistic quality. The circles are hypnotic, and the space is infinite. Upon moving closer, however, everything changes. The visitor focuses on the solid color or abstract design in each “kite;” the meticulous labor of threading together an incalculable number of “kites” is also discernible. 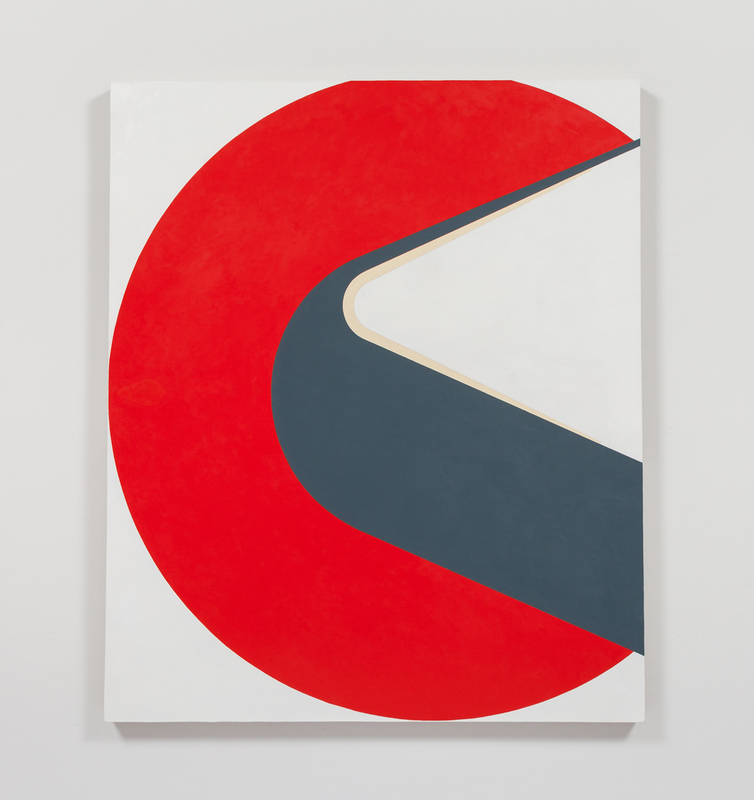 The decision to include Hashimoto’s paintings emphasizes the artist’s concern with space. The oil paintings contain hints of Modernism: flatness emanates, and the illusionism found in his “kite” works is absent, thereby drawing attention to the medium itself. The paintings lack the visual appeal the “kite” works offer, but they serve a critical role: underscoring how different mediums differently question the perception of space.